A radiologist and referring physician discuss strategies of image ordering related to single system trauma in this short, free podcast. Approved for .5 AMA PRA Category 1 Credits™. To find more about all the resources developed for R-SCAN, visit www.rscan.org. This podcast was created as part of the Radiology Support, Communication, and Alignment Network (R-SCAN) initiative. Discover more about R-SCAN at www.rscan.org. 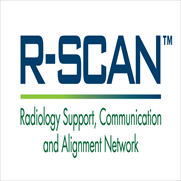 Should you enroll in R-SCAN, you’ll receive immediate free access to this podcast as well as other valuable tools designed to support appropriate image ordering and improve communication between the radiologist and the image ordering provider. -Demonstrate communication practices related to follow-up imaging for single system trauma that can result in improved imaging care. -Describe key considerations for ordering single system trauma follow-up. -Identify strategies for improving image ordering for single system trauma follow-up. The American College of Radiology designates this enduring material for a maximum of 0.5 AMA PRA Category 1 Credits™. Credits awarded for this enduring activity are designated SA-CME by the American Board of Radiology (ABR) and qualify toward fulfilling requirements for Maintenance of Certification (MOC) Part II: Lifelong Learning and Self-Assessment.